The biologic materials currently available for hernia repairs are costly and there are limited statistics on recurrences and rates of infection in connection with their use in complex cases. We performed a retrospective review and comparison of two types of biologic mesh used at our institution for abdominal hernia repairs spanning a 1-year period. 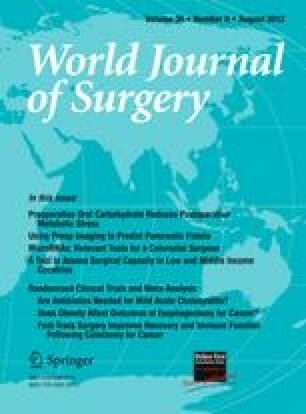 Demographic data and outcomes relating to surgical site infections, hernia recurrences, and mortality were analyzed. Of the 35 patients in the study, 23 patients (Group I) were managed with SurgiMend, a neonatal bovine mesh, and 12 patients (Group II) were managed with Flex HD, a human-derived mesh. The study cohorts met criteria for high-risk stratification based on body mass index, comorbid conditions, and a high prevalence of contaminated wounds. The overall surgical site infection rate was 17 % for Group I and 50 % for Group II. These differences reached statistical significance when comparing superficial infections but not for deep infections with mesh involvement. Hernia recurrences in Group I were 5 % compared to 33 % in Group II. No deaths were observed. These preliminary data demonstrate promising short-term outcomes for high-risk complex hernias repaired with biologic mesh, particularly SurgiMend, but the long-term durability of these biological materials is yet to be determined. The authors declare that they have no competing interest and nothing to disclose.